Or, Why Rebecca Should Really Know Better by Now Than to Ever Go for a Walk in the Woods Without Her Binoculars. I left the house this afternoon intending to go on a short walk and maybe take some photos I could use on my blog. Then, on a whim, I decided to explore an area of the property I’d never been in before, referred to on our trail maps as Muskrat Haven. Muskrat Haven used to be a small lake; back a century or so ago when this was a vacation spot for the wealthy of Cincinnati and Dayton, one of the creeks that runs through here was dammed so that they could have a place to mess around with rowboats. Now that the dam is gone and the lake drained, what remains is a flat, marshy, weedy area crisscrossed by a meandering stream. Whether there are actually any muskrats there or not I don’t know. I followed what I thought at first was a proper hiking trail, but I suspect I was actually on a deer trail, one of many narrow paths trampled through the vegetation. Eventually I found myself on the bank of the stream – the wrong bank from where I needed to be to get back. Try to backtrack the way I’d come? Bushwhack along the bank until I came to the bridge I’d initially crossed over on? Or use the sturdy log that had conveniently fallen across the creek? Feeling adventurous, I chose the third option, but I wasn’t quite brave enough to simply walk across. Instead I straddled the log and scooted across on my rear. Thankfully no one was there to witness my lack of dignity. It was after crossing the creek (and being startled two-thirds of the way across by the loud rattle of a passing kingfisher) and finding my way back to a real trail that I noticed an interesting bird in the branches above me. A bird with a distinctive slender shape, long tail, and curved bill. A cuckoo. But which species (Yellow-billed, which I’d seen once before, or Black-billed, which would be a lifer)? And WHY ON EARTH DID I NOT HAVE MY BINOCULARS WITH ME??? Holding my breath, I crept forward, trying to ease into a position where I could get a better view of the bird without scaring it away. By some miracle, it was sitting in a spot with fairly good light, and it remained where it was and allowed me to get almost directly underneath it. Okay. Dark bill. Check. No conspicuous white spots on the underside of the tail. Check. 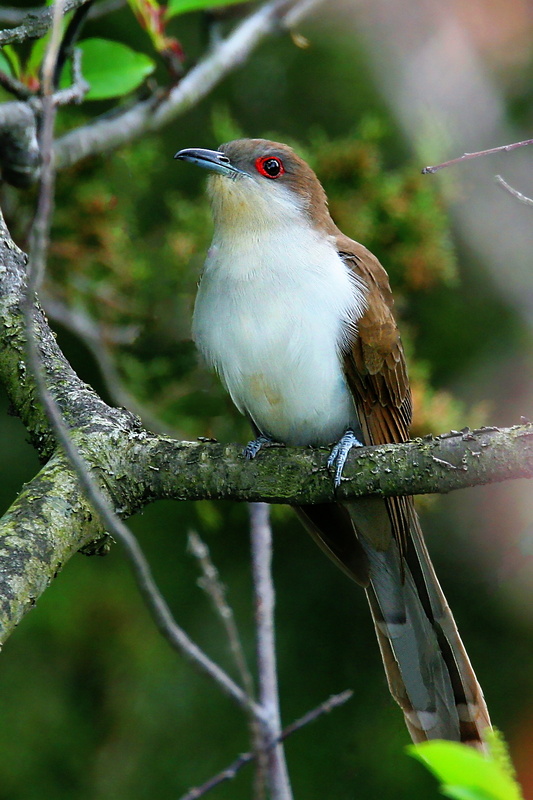 Oh for goodness sake it is a Black-billed Cuckoo! LIFE BIRD NUMBER FIVE HUNDRED AND TWENTY-ONE, AND I DON’T HAVE MY @*#&$% BINOCULARS! In short, I have now vowed never to leave the house without my binoculars again, a vow which will doubtless only last until the next time I step out for what I intend to be just a short walk and end up getting completely sidetracked.